We were going to set up the trail camera at Pond No. 4 for the first time. We drove up to the pond slowly and quietly, staying on the path so we wouldn’t startle the birds. When we reached the pond, we saw two Philippine Ducks standing on an island in the middle of the pond! When Tonji built Pond No. 4, he created an island by leaving an elevated portion in the middle. Seeing the ducks standing on the island and not flying away was amazing! This was a first! I attribute the change in behavior to the island! They must feel safe being on an island in the middle of the water. So there we were in the golf cart and the ducks were not flying away. This was the dream scene I wanted to see for the longest time! I wanted to take a picture. We didn’t bring any cameras! Not even phones! Then I thought, ok I’m now into nature journaling I will just sketch this scene. 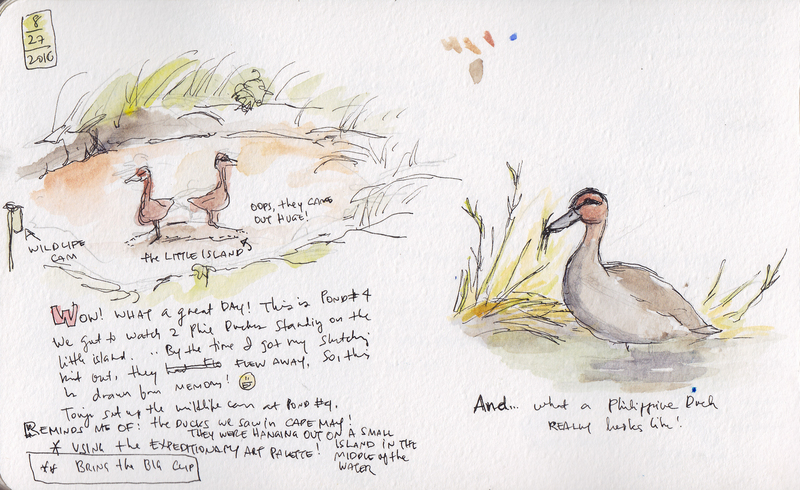 But I was so excited seeing the ducks that I fumbled with my sketch kit, couldn’t pull out the pencil and pen, and then the ducks flew off. I sketched this immediately afterwards. It’s true, in drawings there is a tendency to exaggerate the bits that you find most interesting. Hence the giant ducks! We quickly set up the trail camera and crossed our fingers that the camera would get photos of the ducks on Duck Island! We left the trail camera in place for 13 days. Day 1, not much action. On Day 2 there were 3 ducks. Two flew away but one stayed on the island! It looked like it was there from 8:48 in the morning until 3:25 in the afternoon! On Day 4, a second duck showed up mid-morning. So now there were two ducks on Duck Island! They stayed until 5:14 pm. On Day 10 it rained hard and Duck Island sank! Day 11, there were 3 ducks! Duck Island was exciting while it lasted! Tonji’s new assignment is to figure out how to build a more durable island in the next pond. I am also hoping he’ll build a quiet little viewing deck or blind where we can sit and observe the ducks. I need to improve my duck sketches! Wow! Super great job Sylvia and Tonji! I love your project and I love your sketches (giant ducks and all)! Thank you Trinket! I’m having a lot of fun sketching stuff at the farm. Next Next post: What’s Blooming Now?